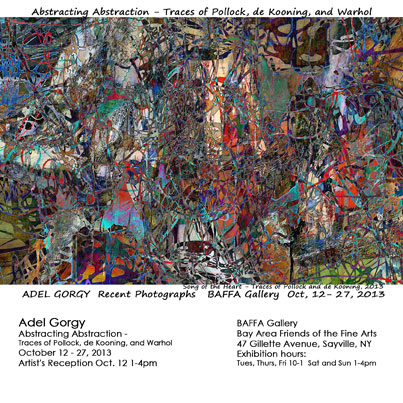 From October 12th through the 27th, BAFFA Gallery in Sayville will present Abstracting Abstraction – Traces of Pollock, de Kooning and Warhol, a solo exhibition of large scale, abstract photographic work by Long Island artist, Adel Gorgy. Merging the conceptual with the visual into complex, multifaceted images, Adel Gorgy’s work extends the boundaries and redefines the possibilities of photography. In his work, the camera is a vital tool, but, unlike traditional photography, where the artist merely records a moment, in these works, Gorgy’s hand and vision are always present, directing, decoding, deciding and defining to arrive at an image that may bear echoes of the original, but in an entirely distinct voice. In this recent series, Abstracting Abstraction – Traces of Pollock, de Kooning and Warhol, traces of these three artists can be perceived. But, just as they morphed and reinterpreted the realities presented to them, Gorgy reconstructs, recontextualizes and recomposes what he sees in their work into complex, intricately detailed photographs rich with imagery and meaning. Gorgy states that he chose these three artists, Pollock, de Kooning and Warhol, not only because he loves their work, but also for what their work means to him in context of his own. So, Gorgy considers this a natural continuation of his previous work where the subject of his art is art, itself. In these pieces, Gorgy poses the question of whether abstract work can be further abstracted. Can a conceptual work be abstracted? Can a vision encompass art, nature and self? The answer, Adel Gorgy says, is a resounding yes, and it is happening in Abstracting Abstraction. Adel Gorgy’s work has been exhibited in museums and galleries nationally and internationally, but he has chosen Long Island as the first venue for this group of photographs. The genesis of this portfolio was a visit to the Pollock-Krasner house in East Hampton. On the floor of Pollock’s studio were innumerable drips of paint, never seen before as anything more than what was left after his paintings were done. Gorgy photographed and recomposed these remnants into completely new compositions. The resulting works of art in Abstracting Abstraction still retain traces of the color and line of Pollock, de Kooning and Warhol but the beauty, strength and vision are those of Adel Gorgy. Long, looping lines of bold colors dance across washes of softer tones. Passages of Pollock peek out from a field of de Kooning, all mingled seamlessly with Gorgy’s own photographs. The alchemical mixtures are surprising, thought-provoking and visually stunning. Adel Gorgy is a New York area artist who photographic artwork has been the subject of three previous solo exhibitions. It has been included in numerous group shows, and published widely in books and magazines. BAFFA Gallery, sponsored by the Bay Area Friends of the Fine Arts, is located in the historic Gillette House in Sayville at 47 Gillette Avenue. It has a long history of presenting exhibitions of local and regional artists, and offering the public a chance to view important contemporary works of art in an intimate, local setting.